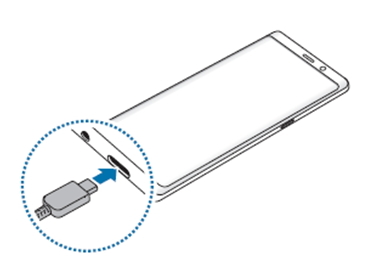 Galaxy Note 8: How do I charge the battery of Galaxy Note 8? Charge the battery before using it for the first time or when it has been unused for extended periods. 1 Connect the USB cable to the USB power adaptor, and plug the USB cable into the device’s multipurpose jack. 3 Charge it unit the phone is fully charged (100%). At this point the unit is ready to be used. Connecting the charger improperly may cause serious damage to the device. Any damage caused by misuse is not covered by the warranty. 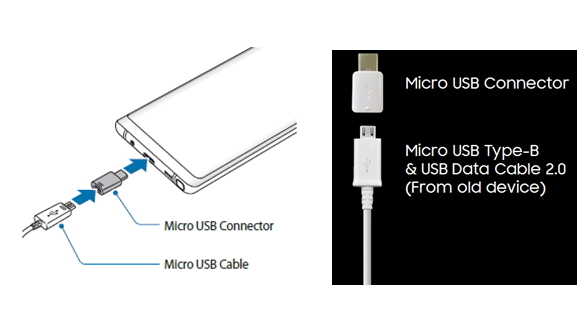 If you want to charge with a Micro USB cable, connect the Micro USB Connector to the phone and than connect the Micro USB cable in to the Micro USB Connector as per photo under.